Offering you a complete choice of products which include automated high tower parking system, multilevel car parking system, two level parking system, puzzle car parking system, tower car parking system and rotary car parking system. The Automated High Tower Parking System is designed with multi-levels and multi-rows and each level is designed with a space as an exchanging space. All space can be lifted automatically except the space in the top level. When the car needs to park or release, all spaces under this car space and forms lifting channel under this space. In this case, the space will go up and down freely. When it reaches the ground, the car will go out and in easily. The Automated Multilevel Car Parking System is designed with multi-levels and multi-rows and each level is designed with a space as an exchanging space. All space can be lifted automatically except the space in the top level. When the car needs to park or release, all spaces under this car space and forms lifting channel under this space. In this case, the space will go up and down freely. When it reaches the ground, the car will go out and in easily. The BTP-PSH Puzzle Car Parking System is designed with multi-levels and multi-rows and each level is designed with a empty space for exchanging. All spaces can be lifted automatically except the spaces in the first level and all the spaces can slide automatically except the spaces in the top level. When a car needs parking or retrieving, all spaces under this car space will slide to the empty space and forms a lifting channel under this space. 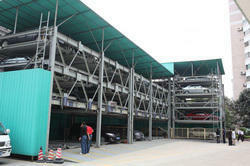 In this case, the space will go up and down freely, when it reaches the ground, the car will go out and in easily. 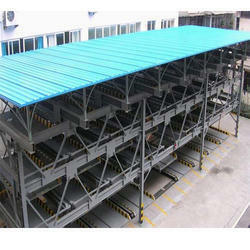 This equipment usually put two cars per level, the plane and space utilization is highest in all type parking systems. This equipment has the advantages of high park/unpark efficient, low noise and low vibration, meet the requirement of urban environment protection. Intelligent control and perfect security, there’s light guide when cars in/out the garage, car over length monitor , speed limit protection and multiple mechanical interlock all guarantee the safety of car and personnel. 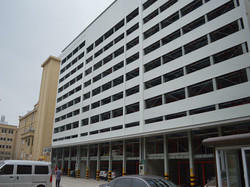 Garage can be designed separately, even in interior of building. And can be arranged abreast with several sets. 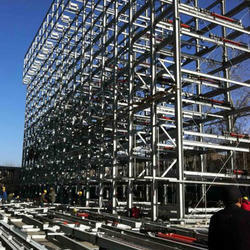 Frame structure can be adopted concrete or steel structure, with different choice and great convenience. Garage have the function of automatic rotary to turn around, can ensure the car goes in/out by front, which is convenient driving in and out of the garage. Complete and reliable safety device, added the function of inspect the car length,width and height, and can check-out if there’s person in car, eradicate the potential risk of the equipment from the technology aspect. The operation is simple and we adopt friendly man-machine interface, such as touch screen. And all the stoppages of the equipment will appear on the screen which is convenient for maintenance. The vertical rotation system consists of transmission driven by speed-reducing motor, and lifts mounted on chains with intervals. 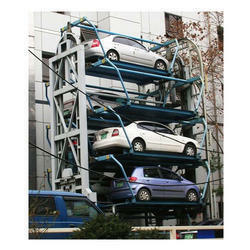 All cars parked on lifts and empty lifts travel vertically when a parking or picking-up is in process. Large car capacity on small land space. 8 cars to 20 cars can be loaded on two conventional parking spaces. Wide choosers of configuration patterns accommodate various size and location requirements. 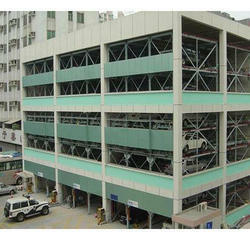 Six Level Puzzle Parking System offered comes in flexible structure finish and can be arranged as per the particular site condition requirements. 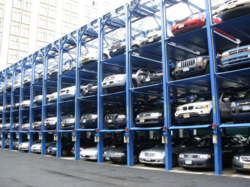 The use of these parking systems allows for saving on land area by making full utilization of space and enhancing the parking capacity to the maximum. 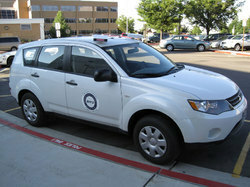 Some of its features include low equipment and maintenance costs; allows for smooth lifting support; complete car parking and retrieving convenience; backed by comprehensive security protection system like safety anti-falling hook; comes with car parking limit, interlock and emergency brake mechanism; advanced PLC automatic control system for smooth usage. Pure license plate recognition system difference with standard system is recognition of license plate by using the license plate recognition camera. Automatic switch on or off, instead of the ticket box and it operation of card taking and returning.